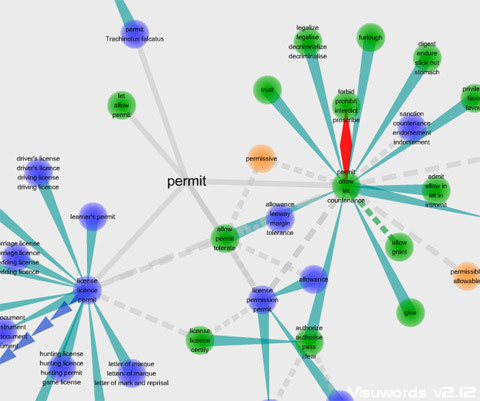 The image above shows the word connections for “permit” – visit the site to get a better view. The various colours represent different types of connections: “is a kind of”, “is a member of”, “opposes”, etc. It’s an excellent way to get an idea of the contexts a word is used in. When you move your mouse over a node, you get more detailed descriptions and sample sentences. You can also drag the nodes and rearrange the image to concentrate on the parts you’re interested in. It works not only as a dictionary but also as a writer’s tool – you can improve your writing by looking up any word you’re unsure about. Cool tool, I will pass this on to my classes.